New York-based fashion show producer and designer Andres Aquino continues to build his international brand worldwide. His recent fashion show at Dubai Fashion Week was a well-received dramatic experience for a market is that heavily inclined to more conservative and traditional fashion collections and presentation styles. 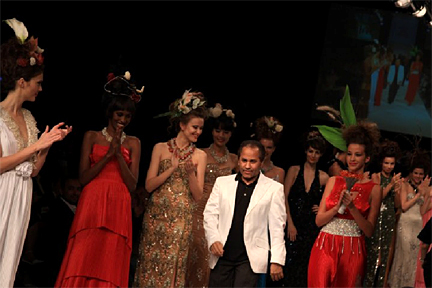 Held on April 3, 2010 in the Godolphin Ballroom of the luxurious Jumeirah Emirates Towers, Mr. Aquino's fashion show at Dubai Fashion Week featured his trademark theatrical elements enhancing the stunning ensembles shown on the runway. The show opened with a performance by Italian singer/dancer Cecilia Herrera Frioni wearing a tropical dress by Andres Aquino, and continued with vignettes and tableaux of models showcasing a range of gowns in different colors and styles. Artistic hair styles were beautifully executed by the Juice team and the creative makeup was done by the L'Oreal team. The overall style of the fashion designs was sophisticated, elegant and bright. 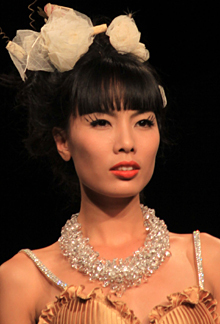 Many gowns were enhanced by custom made oversized necklaces by Toronto-based jewelry designer Lek Nasuwan of Siam Gallery. My theater background played a lot into my designs", notes Mr. Aquino. "I think women are dramatic in the way they walk, speak, and express themselves. I create clothes for many different types of women because every woman is different. No two women are the same, so the clothing should reflect their personality, like a character on stage." Andres Aquino's worldwide fashion journey has seen him showing his collections in New York, Palm Beach, the Dominican Republic, Romania, Mexico, India, Dubai and soon in St. Croix in the US Virgin Islands. In each destination he leaves an impression of fashion as fun and entertaining by incorporating theatrical elements, dance, songs and drama into his runway shows. I am flattered to see that other designers are starting to copy some of my stage presentation formula," says Mr. Aquino. "It certainly makes fashion shows more exciting." Andres Aquino is also the founder and producer of Couture Fashion Week. "Aquino did his bit to inject a bit of drama and theatrics onto the catwalk. Kicking off with a live rendition of a love song, the models strutted down in a string of vintage gowns made in satin and lace and pleated dresses Models who doubled up as celebrities trying to ward off paparazzi and women who shrugged off their suitors added much-needed drama. The accessories the chunky pearls and metallic chokers (by Lek Nasuwan) added a zany touch. -- Gulf News by Manjusha Radhakrishnan, staff reporter; April 5, 2010. Upcoming shows by Mr. Aquino include a gala couture fashion show in St. Croix, US Virgin Islands in May 2010 as part of a literacy fundraiser, and a new collection to be featured at Couture Fashion Week at 8:00 p.m. on September 11, 2010 at the Waldorf-Astoria in New York City. The events are expected to draw a good number of celebrities, VIPs and international press. The Couture Fashion Week New York event will partner this season with the Greater NYC Affiliate of the Susan G. Komen For the Cure in its ongoing efforts to support breast cancer awareness and research.